Sam's has been helping animals and people since 1998. Sam's services include: Personalized Dog walking and Exercising, and Cat Sitting Services. Member of Pet Sitters International, please visit: www.petsit.com. At no charge I will meet with you for an initial consultation to determine needs, get instructions, get oriented, and get connected with the animals. On each visit Sam's leaves a written status report. With you and your dog we come up with an individual plan that works. We provide a traditional dog walk, a workout dog walk, exercising while on lead or in backyard. If your dog needs socialization then they can walk with my rescue dog Norton. We can mixed all of these services with your dog for maximum benefit. For an older dog or disabled dog, we can do a slow walk so they can smell the roses. We come to your home once, twice, or three times a day. Each visit we provide positive interaction with your animals. We provide play/exercise, feed, clean litter boxes, and give medications. I sit on the floor and pet, play and comb your cats for a good bit of time. We bring in mail/papers and water plants,etc. Our goal is to bond with every animal we are with. While you are away, we will bring in the mail, water plants, feed the fish. We switch lights and do other security checks, and perform other minor tasks as needed. I want my customers to like the service they receive from Sam's so they will let others know. Consequently, the animals I care for and the services I provide is my best advertising. Most of my referrals come from my clients, because they see a difference in the care of their animals; and the animals show them! Sam's will go out of its way to provide information and referral so the potential client finds the person and care that works best for his or her situation. If your needs are someone to stay with your dog in your home while you are away, Sam's will assist you in finding the someone in your area that provides that service. Feel free to call or send email for more information. Sam on the ranch in Montana. For 20 years I was involved in a variety of levels of social service work. I wanted to create and run a small business that involved customer service, trust, communication, feedback, and animals. I chose pet sitting services because of my ability to develop a connection with dogs and cats, and my concern that they receive quality care. I wanted the animals to let their owners know that they can trust Sam's. In other words the owners could tell a difference, whether it was pet sitting a shy cat or daily dog walking. 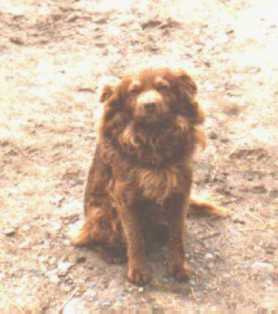 Sam was an abused stray mixed breed dog a friend of mine found at the Canadian border. My friend moved and could longer keep Sam, and I gladly said I would care for him. The two of us were inseparable the next 14 years. Though not a large dog, he had a strong personality. His reddish coat would cause people to stop and ask questions about him. I named the business after Sam, to honor him. We had a powerful relationship for those 14 years. I spent a number of years as a ranch hand in Montana. The vast majority of each day was spent caring for a variety of animals. It is on the ranch that I realized that I had a connection with animals. I witnessed my dog Sam blossom while at the ranch.